PurposeTo compare the quality of four OCT-angiography(OCT-A) modules.MethodThe retina of nineteen healthy volunteers were scanned with four OCT-devices (Topcon DRI-OCT Triton Swept-source OCT, Optovue RTVue-XR, a prototype Spectralis OCT2, Heidelberg-Engineering and Zeiss Cirrus 5000-HD-OCT). The device-software generated en-face OCT-A images of the superficial (SCP) and deep capillary plexuses (DCP) were evaluated and scored by 3 independent retinal imaging experts. The SCP vessel density was assessed using Angiotool-software. After the inter-grader reliability assessment, a consensus grading was performed and the modules were ranked based on their scoring.ResultsThere was no significant difference in the vessel density among the modules (Zeiss 48.7±4%, Optovue 47.9±3%, Topcon 48.3±2%, Heidelberg 46.5±4%, p = 0.2). The numbers of discernible vessel-bifurcations differed significantly on each module (Zeiss 2±0.9 bifurcations, Optovue 2.5±1.2, Topcon 1.3±0.7 and Heidelberg 0.5±0.6, p≤0.001). The ranking of each module differed depending on the evaluated parameter. In the overall ranking, the Zeiss module was superior and in 90% better than the median (Bonferroni corrected p-value = 0.04). Optovue was better than the median in 60%, Topcon in 40% and Heidelberg module in 10%, however these differences were not statistically significant.ConclusionEach of the four evaluated OCT-A modules had particular strengths, which differentiated it from their competitors. Amplitude decorrelation measurement is sensitive to transverse flow and immune to phase noise in comparison to Doppler and other phase-based approaches. However, the high axial resolution of OCT makes it very sensitive to the pulsatile bulk motion noise in the axial direction. To overcome this limitation, we developed split-spectrum amplitude-decorrelation angiography (SSADA) to improve the signal-to-noise ratio (SNR) of flow detection. The full OCT spectrum was split into several narrower bands. Inter-B-scan decorrelation was computed using the spectral bands separately and then averaged. The SSADA algorithm was tested on in vivo images of the human macula and optic nerve head. It significantly improved both SNR for flow detection and connectivity of microvascular network when compared to other amplitude-decorrelation algorithms. 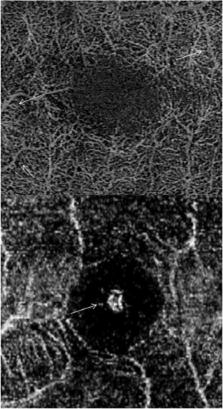 IMAGE ARTIFACTS IN OPTICAL COHERENCE TOMOGRAPHY ANGIOGRAPHY. To describe image artifacts of optical coherence tomography (OCT) angiography and their underlying causative mechanisms. To establish a common vocabulary for the artifacts observed. Angiogenesis is the generation of mature vascular networks from pre-existing vessels. Angiogenesis is crucial during the organism' development, for wound healing and for the female reproductive cycle. Several murine experimental systems are well suited for studying developmental and pathological angiogenesis. They include the embryonic hindbrain, the post-natal retina and allantois explants. In these systems vascular networks are visualised by appropriate staining procedures followed by microscopical analysis. Nevertheless, quantitative assessment of angiogenesis is hampered by the lack of readily available, standardized metrics and software analysis tools. Non-automated protocols are being used widely and they are, in general, time - and labour intensive, prone to human error and do not permit computation of complex spatial metrics. We have developed a light-weight, user friendly software, AngioTool, which allows for quick, hands-off and reproducible quantification of vascular networks in microscopic images. AngioTool computes several morphological and spatial parameters including the area covered by a vascular network, the number of vessels, vessel length, vascular density and lacunarity. In addition, AngioTool calculates the so-called “branching index” (branch points / unit area), providing a measurement of the sprouting activity of a specimen of interest. We have validated AngioTool using images of embryonic murine hindbrains, post-natal retinas and allantois explants. AngioTool is open source and can be downloaded free of charge. Competing Interests: I have read the journal's policy and the authors of this manuscript have the following competing interests: Sebastian Wolf is a consultant for Heidelberg Engineering and Zeiss. Martin S Zinkernagel is a consultant for Heidelberg Engineering. The remaining authors have no financial/proprietary interests relevant to this paper. This does not alter our adherence to PLOS ONE policies on sharing data and materials. Data curation: MRM HGZ LB WH AE. Validation: WH MRM HGZ LB. Writing – original draft: MRM. Writing – review & editing: MRM HGZ LB WH AE SW MSZ. Inter- and intraobserver variation in the analysis of optic disc images: comparison of the Heidelberg retina tomograph and computer assisted planimetry. MDCT angiography of the renal arteries in patients with atherosclerotic renal artery stenosis: implications for renal artery stenting with distal protection. High-resolution imaging of basal cell carcinoma: a comparison between multiphoton microscopy with fluorescence lifetime imaging and reflectance confocal microscopy.